In this article, you learn how to diagnose a network traffic filter problem by viewing the network security group (NSG) security rules that are effective for a virtual machine (VM). NSGs enable you to control the types of traffic that flow in and out of a VM. 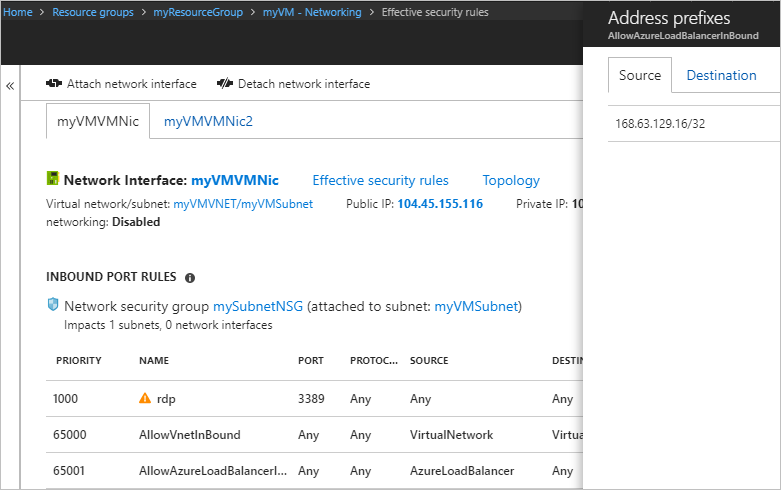 You can associate an NSG to a subnet in an Azure virtual network, a network interface attached to a VM, or both. The effective security rules applied to a network interface are an aggregation of the rules that exist in the NSG associated to a network interface, and the subnet the network interface is in. Rules in different NSGs can sometimes conflict with each other and impact a VM's network connectivity. You can view all the effective security rules from NSGs that are applied on your VM's network interfaces. If you're not familiar with virtual network, network interface, or NSG concepts, see Virtual network overview, Network interface, and Network security groups overview. You attempt to connect to a VM over port 80 from the internet, but the connection fails. To determine why you can't access port 80 from the Internet, you can view the effective security rules for a network interface using the Azure portal, PowerShell, or the Azure CLI. The steps that follow assume you have an existing VM to view the effective security rules for. If you don't have an existing VM, first deploy a Linux or Windows VM to complete the tasks in this article with. The examples in this article are for a VM named myVM with a network interface named myVMVMNic. The VM and network interface are in a resource group named myResourceGroup, and are in the East US region. Change the values in the steps, as appropriate, for the VM you are diagnosing the problem for. Log into the Azure portal with an Azure account that has the necessary permissions. At the top of the Azure portal, enter the name of the VM in the search box. When the name of the VM appears in the search results, select it. mySubnetNSG: Associated to the subnet that the network interface is in. myVMNSG: Associated to the network interface in the VM named myVMVMNic. The rule named DenyAllInBound is what's preventing inbound communication to the VM over port 80, from the internet, as described in the scenario. The rule lists 0.0.0.0/0 for SOURCE, which includes the internet. No other rule with a higher priority (lower number) allows port 80 inbound. To allow port 80 inbound to the VM from the internet, see Resolve a problem. 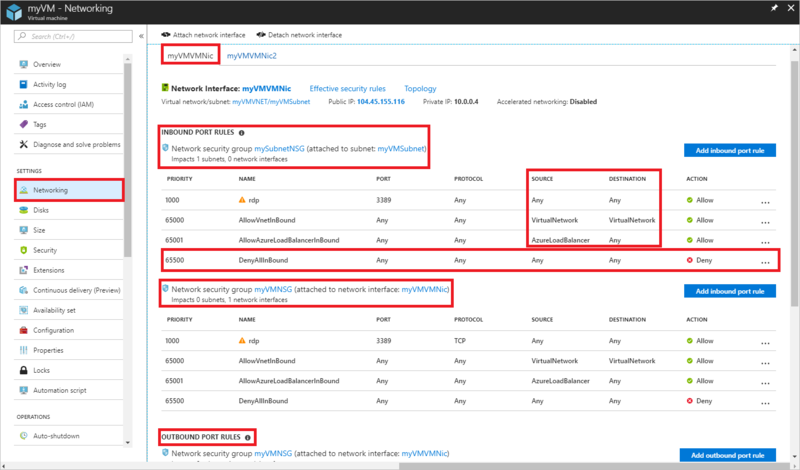 To learn more about security rules and how Azure applies them, see Network security groups. At the bottom of the picture, you also see OUTBOUND PORT RULES. Under that are the outbound port rules for the network interface. Though the picture only shows four inbound rules for each NSG, your NSGs may have many more than four rules. In the picture, you see VirtualNetwork under SOURCE and DESTINATION and AzureLoadBalancer under SOURCE. VirtualNetwork and AzureLoadBalancer are service tags. Service tags represent a group of IP address prefixes to help minimize complexity for security rule creation. The rules listed are the same as you saw in step 3, though there are different tabs for the NSG associated to the network interface and the subnet. As you can see in the picture, only the first 50 rules are shown. To download a .csv file that contains all of the rules, select Download. Though the AzureLoadBalancer service tag only represents one prefix, other service tags represent several prefixes. The previous steps showed the security rules for a network interface named myVMVMNic, but you've also seen a network interface named myVMVMNic2 in some of the previous pictures. The VM in this example has two network interfaces attached to it. The effective security rules can be different for each network interface. To see the rules for the myVMVMNic2 network interface, select it. As shown in the picture that follows, the network interface has the same rules associated to its subnet as the myVMVMNic network interface, because both network interfaces are in the same subnet. When you associate an NSG to a subnet, its rules are applied to all network interfaces in the subnet. Unlike the myVMVMNic network interface, the myVMVMNic2 network interface does not have a network security group associated to it. Each network interface and subnet can have zero, or one, NSG associated to it. The NSG associated to each network interface or subnet can be the same, or different. You can associate the same network security group to as many network interfaces and subnets as you choose. Network interface: Learn how to view a network interface. NSG: Learn how to view an NSG. You can run the commands that follow in the Azure Cloud Shell, or by running PowerShell from your computer. The Azure Cloud Shell is a free interactive shell. It has common Azure tools preinstalled and configured to use with your account. If you run PowerShell from your computer, you need the Azure PowerShell module, version 1.0.0 or later. Run Get-Module -ListAvailable Az on your computer, to find the installed version. If you need to upgrade, see Install Azure PowerShell module. If you are running PowerShell locally, you also need to run Connect-AzAccount to log into Azure with an account that has the necessary permissions]. Output is returned in json format. To understand the output, see interpret command output. Output is only returned if an NSG is associated with the network interface, the subnet the network interface is in, or both. The VM must be in the running state. A VM may have multiple network interfaces with different NSGs applied. When troubleshooting, run the command for each network interface. If you're still having a connectivity problem, see additional diagnosis and considerations. In the previous output, the network interface name is myVMVMNic. If using Azure Command-line interface (CLI) commands to complete tasks in this article, either run the commands in the Azure Cloud Shell, or by running the CLI from your computer. This article requires the Azure CLI version 2.0.32 or later. Run az --version to find the installed version. If you need to install or upgrade, see Install Azure CLI. If you are running the Azure CLI locally, you also need to run az login and log into Azure with an account that has the necessary permissions. In the previous output, the network interface name is myVMVMNic interface. NetworkSecurityGroup: The ID of the network security group. Association: Whether the network security group is associated to a NetworkInterface or Subnet. If an NSG is associated to both, output is returned with NetworkSecurityGroup, Association, and EffectiveSecurityRules, for each NSG. If the NSG is associated or disassociated immediately before running the command to view the effective security rules, you may need to wait a few seconds for the change to reflect in the command output. EffectiveSecurityRules: An explanation of each property is detailed in Create a security rule. Rule names prefaced with defaultSecurityRules/ are default security rules that exist in every NSG. Rule names prefaced with securityRules/ are rules that you've created. Rules that specify a service tag, such as Internet, VirtualNetwork, and AzureLoadBalancer for the destinationAddressPrefix or sourceAddressPrefix properties, also have values for the expandedDestinationAddressPrefix property. The expandedDestinationAddressPrefix property lists all address prefixes represented by the service tag. If you see duplicate rules listed in the output, it's because an NSG is associated to both the network interface and the subnet. Both NSGs have the same default rules, and may have additional duplicate rules, if you've created your own rules that are the same in both NSGs. The rule named defaultSecurityRules/DenyAllInBound is what's preventing inbound communication to the VM over port 80, from the internet, as described in the scenario. No other rule with a higher priority (lower number) allows port 80 inbound from the internet. Destination The IP address of the VM, a range of IP addresses, or all addresses in the subnet. After you create the rule, port 80 is allowed inbound from the internet, because the priority of the rule is higher than the default security rule named DenyAllInBound, that denies the traffic. Learn how to create a security rule. If different NSGs are associated to both the network interface, and the subnet, you must create the same rule in both NSGs. When Azure processes inbound traffic, it processes rules in the NSG associated to the subnet (if there is an associated NSG), and then it processes the rules in the NSG associated to the network interface. If there is an NSG associated to the network interface and the subnet, the port must be open in both NSGs, for the traffic to reach the VM. To ease administration and communication problems, we recommend that you associate an NSG to a subnet, rather than individual network interfaces. If VMs within a subnet need different security rules, you can make the network interfaces members of an application security group (ASG), and specify an ASG as the source and destination of a security rule. Learn more about application security groups. If you're still having communication problems, see Considerations and Additional diagnosis. Default security rules block inbound access from the internet, and only permit inbound traffic from the virtual network. To allow inbound traffic from the Internet, add security rules with a higher priority than default rules. Learn more about default security rules, or how to add a security rule. If you have peered virtual networks, by default, the VIRTUAL_NETWORK service tag automatically expands to include prefixes for peered virtual networks. To troubleshoot any issues related to virtual network peering, you can view the prefixes in the ExpandedAddressPrefix list. Learn more about virtual network peering and service tags. Effective security rules are only shown for a network interface if there is an NSG associated with the VM's network interface and, or, subnet, and if the VM is in the running state. If there are no NSGs associated with the network interface or subnet, and you have a public IP address assigned to a VM, all ports are open for inbound access from and outbound access to anywhere. If the VM has a public IP address, we recommend applying an NSG to the subnet the network interface. 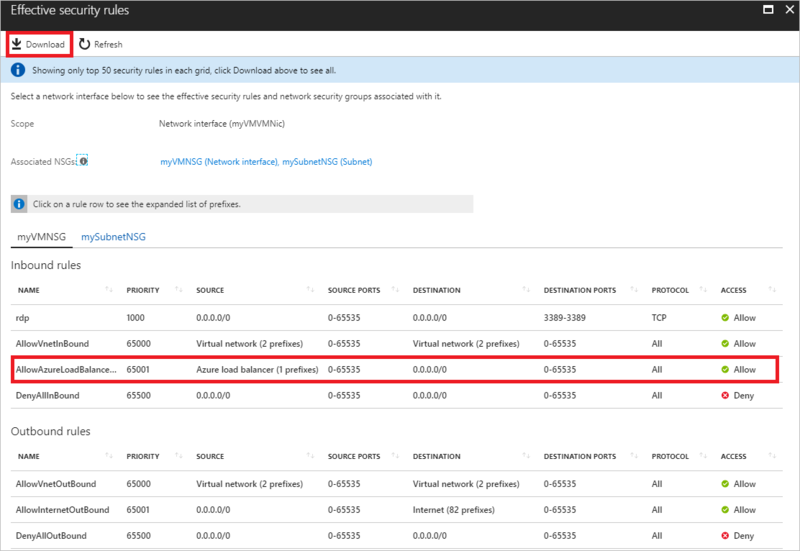 To run a quick test to determine if traffic is allowed to or from a VM, use the IP flow verify capability of Azure Network Watcher. IP flow verify tells you if traffic is allowed or denied. If denied, IP flow verify tells you which security rule is denying the traffic. Routes configured for virtual appliances or on-premises traffic. Internet traffic can be redirected to your on-premises network via forced-tunneling. If you force tunnel internet traffic to a virtual appliance, or on-premises, you may not be able to connect to the VM from the internet. To learn how to diagnose route problems that may impede the flow of traffic out of the VM, see Diagnose a virtual machine network traffic routing problem. Learn about all tasks, properties, and settings for a network security group and security rules. 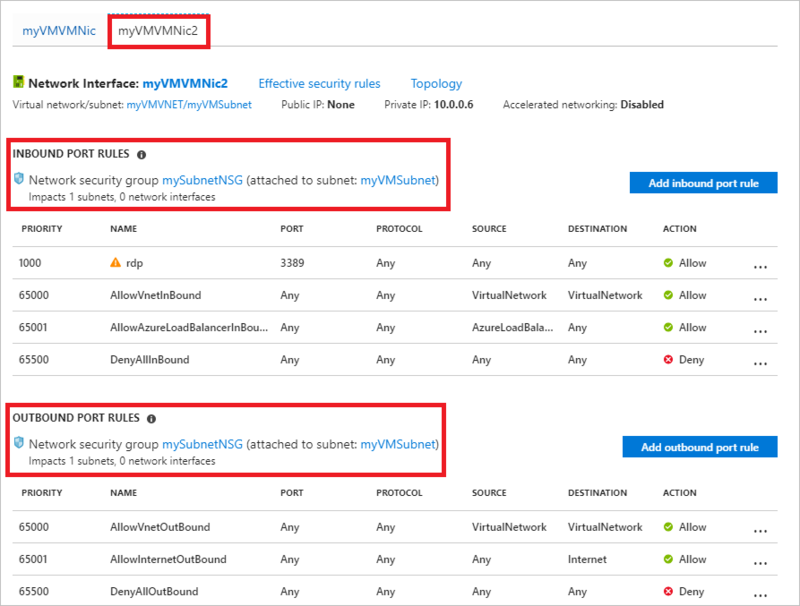 Learn about default security rules, service tags, and how Azure processes security rules for inbound and outbound traffic for a VM.